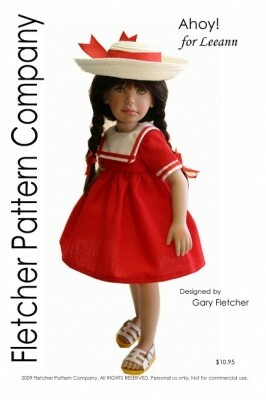 Up for consideration is an adorable sailor style dress for 11" LeeAnn caled Ahoy! designed by Gary Fletcher. This dress pattern is also available for the 14" Crysalis Kish dolls. Fabric: Cottons, Calicos, Broadcloth. Contrasting fabric for dress yoke. Notions: Matching thread, approximately 1 yard of trim and 4 snap sets.